Things just seem to get better and better at West Brom. Yesterday's fight back at Old Trafford must be one of our best results in the Premiership. I was listening to the car radio and when the equaliser went in I nearly crashed (I was in the outside lane of the M1) so I had to turn the radio off just in case we nicked it!! Having watched the game you could argue there was more than a little bit of good fortune about our goals particularly the equaliser but we created our own luck by being positive even though we were two goals down. Unless Tchoyi makes a positive run into the box to try and get onto the end of a cross Van Der Sar's fumble is embarrassing but there is no goal. Inevitably all the media attention has been on Man U playing badly and the demise of Wayne Rooney, Chris Lepkowski has suggested that this irritates the Albion players a little which is good, players with a point to prove are generally well motivated. However the rumour mill is starting to link various players with moves to bigger clubs the latest is Chris Brunt apparently being targeted by Liverpool. One would have to wonder why Brunt would want to move from a club challenging for European football to one in a relegation scrap (now I am getting ahead of myself). Much of the progress we have made as a club could be undermined if we lose key players if not in January, then over the summer. 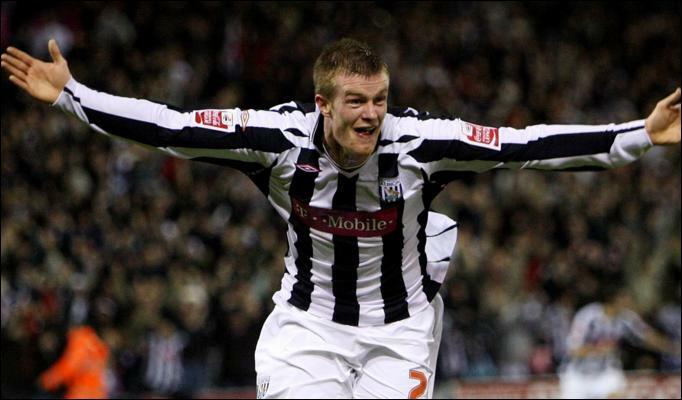 In that context it was interesting to note that the club matched Fulham's offer to Greening in a bid to keep him prior to his move in 2009. This showed a willingness on the part of the club to take a risk given that the wages in question were no doubt substantial and at the time we were in the Championship. Albion fans have criticised Chairman Jeremy Peace for his lack of ambition but to be fair to our Chairman he has built on sound foundations and hopefully we will able to see off the predators so we can continue to grow and we can look forward to more days like yesterday. In the meantime I am going to the Hawthorns to watch us against Fulham next Saturday and hopefully collect at least a point towards out first target, which in case anyone is in any danger of getting carried away is 40 points for survival.